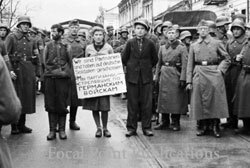 THE young girl shown about to be executed in your current Radical's Diary has been named on various web sites as seventeen-year old Masha Bruskina, and the date given for the executions is quoted as October 26, 1941, in the city of Minsk. The young man with her is named as Volodya Sherbateivich, and the older one as Krill Trous. . . . I hope this helps your readers.